For one day, your child will discover fairies don’t just live at the bottom of the garden. 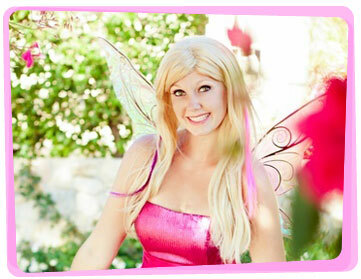 Our Fairies for hire in Melbourne bring fantasy to life with their bright, beautiful costumes making any event sparkle and glisten. 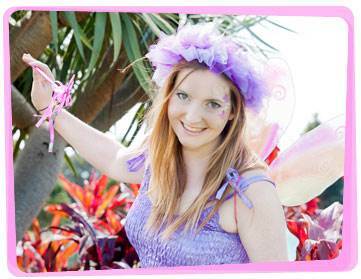 Our enchanting Fairy will flutter in to your kids birthday party with an array of party ideas under her wings including a magic show, face painting and lots more. We service the entire metropolitan area and provide entertainment for all types of events. 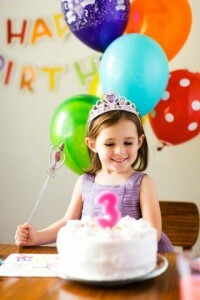 On the day of your kid’s birthday party in Melbourne, your fairy entertainer groups the children into two teams. Each child gets a large feather. The first player walks whilst blowing his/her feather, trying to keep it up in the air. If the feather lands on the ground, he/she picks it up and starts where the feather has landed. Once the player reaches the finish line, he/she runs back to the starting line and tags the next player. The first team who finishes first wins! 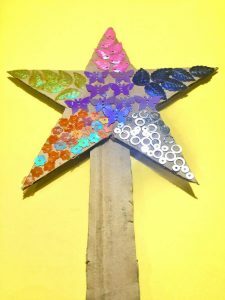 Cut out 2 star shapes from your cardboard. For the handle, cut a long narrow rectangle from the cardboard as well. Hot glue one end of the handle to the star. Once it’s dried, hot glue the other star to the star with the handle. The handle should be in the middle of the two stars. 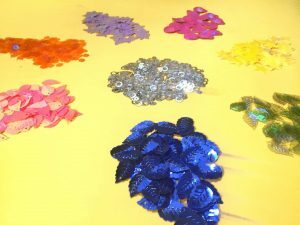 Place beads, sequins, and jewels in separate containers. Put washable paints and paintbrushes too! Display everything on a table. Looking for more? 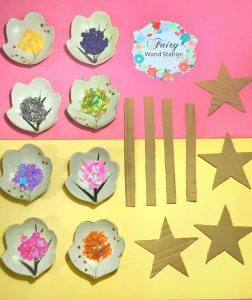 Stop by Party Plate at 885 High Street, Thornbury, VIC Australia and see their fairy party decorations!